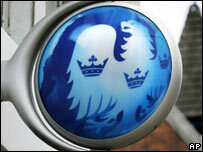 Barclays has denied rumours it is about to reveal a $10bn (£4.8bn) exposure to US mortgage bad debt. The speculation saw shares in the banking giant plunge 9% during Friday trading, and they were at one point even temporarily suspended. Barclays denied the rumours, saying they were "unsubstantiated", and its shares recovered some ground to end the day down 2.4% to 474.50p. Other UK financial stocks closed lower, following the rumours about Barclays. Shares in Royal Bank of Scotland ended down 3%, while HBOS, HSBC and Alliance & Leicester all lost more than 2%. While Barclays' comments helped ease some concerns, worries continue over which UK bank may be next to follow Northern Rock and suffer from the ongoing global credit crisis. "There is still a great deal of uncertainty around, the financials in particular," said Richard Hunter of Hargreaves Lansdown. "The market is definitely pricing in the worst scenario at the moment." These fears have gained momentum in the past weeks following announcements from some of the world's largest banks, including US giants Citigroup and Merrill Lynch, that their mortgage investments had lost billions of dollars in value. The bosses of Citigroup and Merrill Lynch both stepped down after the extent of the damage caused by the erosion of the banks' mortgage-backed securities operations became apparent. A Barclays spokesman said: "There is absolutely no substance in these rumours." He also said that the bank's chief executive John Varley would not quit, despite the rumours that the company was preparing to change its top management. The credit crisis has been sparked by bad debt in the US household mortgage sector, specifically sub-prime home loans. As US mortgage rates have risen sharply over the past year, the sub-prime sector, which specialises in loans to people with poor credit histories or those on low incomes, has seen record levels of loan defaults. The crisis then spread to the wider global debt market as banks have become much less willing to lend to each other until the full extent of the problem is known.